Talal Derki was born in Damascus and is based in Berlin since 2014. He studied film directing in Athens and worked as an assistant director for many feature film productions and was a director for different Arab TV programs between 2009 and 2011. Talal's short films and feature length documentaries received many awards at a variety of festivals. 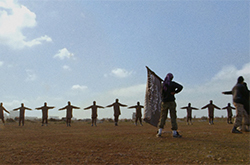 His feature documentary RETURN TO HOMS has won the Sundance Film Festival’s World Cinema Grand Jury Prize in 2014. The same year, he was also a member of the international Jury at IDFA. Talal Derki returns to his homeland, where he gains the trust of a radical Islamist family. Sharing the family's daily life through the lens of his camera provides an extremely rare insight into what it means to grow up in an Islamic caliphate. The result is an unfettered vérité portrait of al-Nusra general Abu Osama—a radical Islamist leader and loving father—and the gaggle of young boys who idolize him. Chief among these boys is the leader’s son Osama, named after Dad’s personal hero, Osama bin Laden.In this remote village in northern Syria, a landscape of bombed-out homes, abandoned tanks, and minefields becomes a playground for young boys taught to stone any girls who dare to show their faces in public. Schools have been decimated. Education consists of reciting the Qur'an and attending military training camp. Bedtime stories regale the glory of martyrdom. With unparalleled intimacy, Of Fathers and Sons captures that chilling moment when childhood dies and jihadism is born.